If you love cunning iPhone games take a look at the cute and fun app from Electric Pixel called Gorilla Gondola. While I’m not typically the biggest fan of side-scrollers, I definitely had a ton of fun playing Gorilla Gondola. In short, this app is worthwhile, and the character’s resemblance to Donkey Kong doesn’t hurt either. The novelty of being a gorilla on a gondola is obviously the first thing one notices about this application. The cute idea is probably worth half the price, and the gameplay is what makes this app worth playing. The use of the iPhone’s physics based controls is fun, being about to tilt the gorilla left and right by tilting your iPhone, and swiping to jump and avoid obstacles is quite amusing. There are also some pretty cool features in this game such as the gates. Basically there are red and blue gates surrounding your gorilla and the challenge is to get the character and/or the gondola through the correctly colored gates at the same time to win a little bonus. As you play through, you get to see some of the other cool features like the fans. The fans blow you over obstacles or push you into places you don’t want to go. You have the option of turning the fans on and off. These progressive features keep Gorilla Gondola interesting and keep you coming back. The colors and graphics in Gorilla Gondola are beautiful. The mix of the dancing landscapes that you fly through on your gondola combined with very fitting music actually give this game a relaxed vibe. Especially in the underwater level, which was my personal favorite. 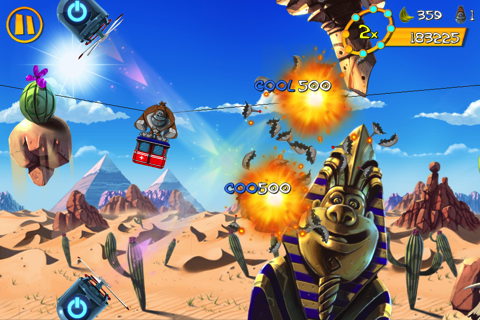 It was fun playing Gorilla Gondola on my iPhone 4 for this review. The game has stunning hi-res graphics, and I could imagine playing this universal game on an iPad 2 would be just as amazing. In terms of value I think this application is worth its $2 price. It is a worthy purchase to add to your iPhone games collection, and as I stated before the novelty and beauty are outstanding. The gameplay is fun, although unlocking levels was kind of difficult. I had to play through levels a couple times since unlocking levels is tied to completing objectives. Overall, I really did enjoy the gameplay in Gorilla Gondola. I’m sure both the casual iOS fan to the most die-hard iPod touch gamer would appreciate this title. Definitely not a game to beat in one sitting, rather a casual play which you could fire up for those small periods of waiting in your day, like waiting for the bus. Gorilla Gondola is definitely a fun app to have on your device. AppSafari review of Gorilla Gondola was written by Darius Reimm on March 4th, 2012 and categorized under Action, App Store, Arcade, Games, iPad apps, Physics Based, Universal. Page viewed 3492 times, 2 so far today. Need help on using these apps? Please read the Help Page.